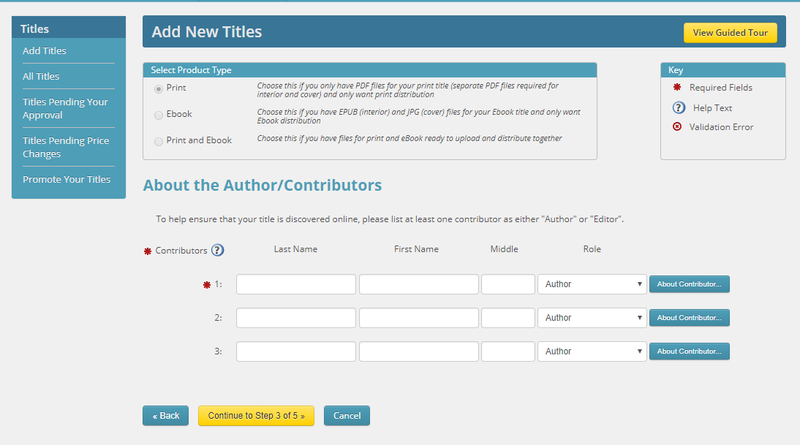 For some reason, authors seem to be intimidated by IngramSpark, but it’s really quite simple to navigate. The most difficult part of publishing to IngramSpark is making sure your manuscript is ready. I’ve never had a manuscript that worked for CreateSpace not work for IngramSpark. After all, 6×9 is 6×9; there’s no reason for a manuscript not to work on both. Having said that, IngramSpark will reject any manuscript that doesn’t have all of the fonts embedded. If you use CreateSpace, you’re probably used to getting “warnings” that tell you a font wasn’t embedded. Saving from Microsoft Word to a PDF doesn’t always embed all the fonts. CreateSpace will embed them for you, but IngramSpark won’t; they’ll reject your file. Enter your publishing name. Think of “subjects” as akin to CreateSpace categories. Enter a subject (for example, “fantasy”), and click to search for it. Choose the category that best suits your book. Regional subject is kind of cool. If your book is set in a particular region, you can search for that region and add it. Thema subjects, as described by IngramSpark, “offer global and unique subjects to categorize your book.” If you have a unique topic, search for it, and add it if you so desire. I’ve never used the “Table of Contents” field. Paperback novels don’t typically have a TOC, and the handful of poetry books I’ve published have the TOC up front and center. I wish I could show you what happens when your files are uploaded, but I can’t get a screenshot of that at this time, because I’m not ready to upload my files. But, it’ll whirl around for a minute, and then you’ll be taken to a payment page. 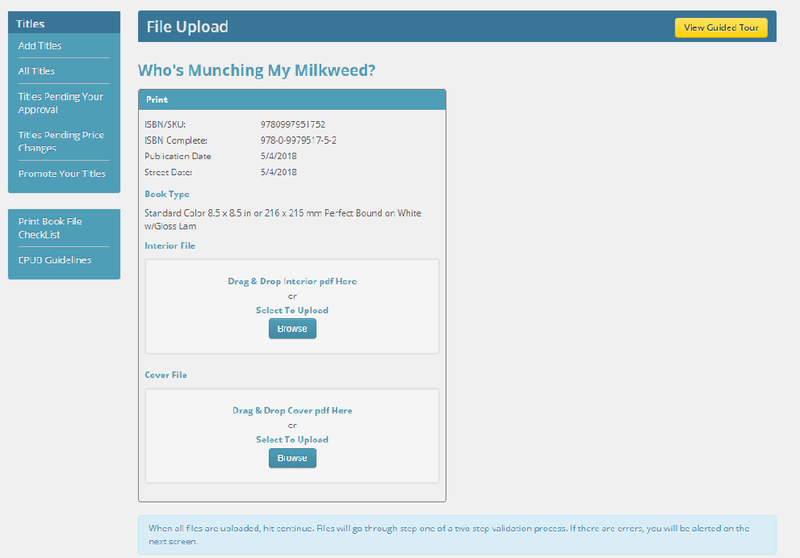 It’s $49 to upload a file to IngramSpark, but they have frequent specials during which it’s free. If there’s an issue, they’ll email to tell you what it is so you can correct it and try again. See? Easy. Nothing at all to be afraid of, but if you have questions feel free to ask them in the comments and I’ll do my best to help. Thanks, Melinda, for the informative breakdown. The $49 price will discourage many writers. CreateSpace and KDP Print are (currently) free. I agree the price is discouraging. Thankfully, a couple of times a year IngramSpark sends out coupons for a free upload. Anyone with an account should receive the emails, even if they haven’t yet uploaded any books. As unenthusiastic as I am about trying a new platform, I may set up an account and wait. How long do the coupons generally last? In my experience, they usually last at least a month. For example, they’ve historically sent out coupon codes for a free upload during NaNoWriMo, and the code is good for the entire month. Another thought, Kathy – I’m a member of the Independent Book Publishers Association, and one of the perks of membership for 2018 has been a coupon code to use for free uploads and revisions on IngramSpark. Depending on the number of books a person has, the membership fee to IBPA might be the most economical way to go. It certainly has been for me. Hm. It looks like the coupon associated with IBPA is effective for three months. Thanks, Melinda. It’ll be good through the end of the year, and I’m seriously hoping it’s one of the perks offered next year, too. Thanks, Melinda. This is timely for me. My wife and I are closing down our tiny little publishing company, and I need an alternative for my own works. Ingram Spark was recommended to my by another writer, but I hadn’t had time to look into it yet. I gather from what you’ve written that we can uploaded a PDF and it will be printed exactly as we provide it. We currently use Adobe InDesign to create professional print-ready PDFs, so that’s what we want. Is it also possible to do ebook conversions through Ingram Spark? If not, how do you typically handle those? I’ve been making this case repeatedly on my blog, as well as arguing that you can easily do your own book interior for Ingram and for Amazon. There’s just no reason not to publish in both places. AND you can take the ISBN you buy to publish at Ingram with you to Amazon; you can’t take your free Amazon ISBN to Ingram. Thanks for this post! You’re very welcome, Virginia! Yep, I purchase my own ISBNs and use both CreateSpace (well, now KDP Print) and IngramSpark, and it works very well for me. Thank you for this tutorial! I’m planning to publish a paperback edition of my out-of-print novel to which I now have my rights back. If I use Vellum on the Mac, will it also embed my fonts for me? And is there anything else I need to know? I’m not familiar with Vellum, but I found formatting my own files for Ingram quite doable. I’ve written a how-to on formatting your own paperback using InDesign. You can ALMOST do it for free, too–Adobe has a free trial. Thanks for stopping by, Phillip! MElinda: EXcellent article. I too have found that the Ingram/SPark interfaceoffers no problems if your manuscript is formatted correctly. I hjave published to the three platforms, CreateSpace, Ingram & KDP. I found no issues with Ingram, but I have found many with KDP, even on the books moved from CreateSpace to KDP. Thanks, David! The CreateSpace-to-KDP Print migration has been a little buggy, hasn’t it? Most of the issues I had sorted themselves out after a couple of days, but make sure all your keywords are there and your categories are selected (some of mine wandered away on the trip over). I hear you: apologies for all the typos, I was running out. And , yes, the KDP print is buggy, but the biggest issue was that they required my changing the cover that has been on Amazon for two years; and every version I posted after that was wrong, with different issues each time. I am planning on pulling it and just using Ingram for it. I haven’t found a downside about doing that yet. 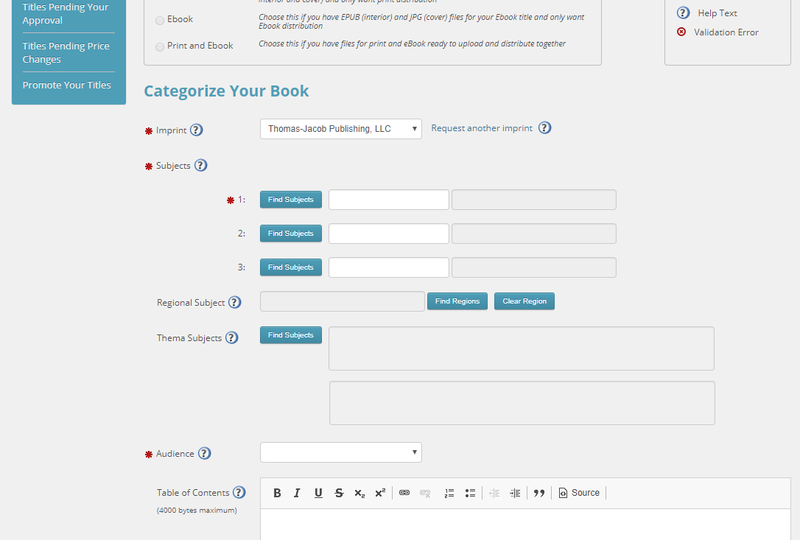 Earlier this year, I started using IngramSparks to expand my book distribution. I like using it, so far I have done six books with IngramSparks. Your directions are a true depiction of how easy it is to use. And your advice to look for the discount sales is great advice, otherwise, you pay everytime you upload a manuscript or a cover template. 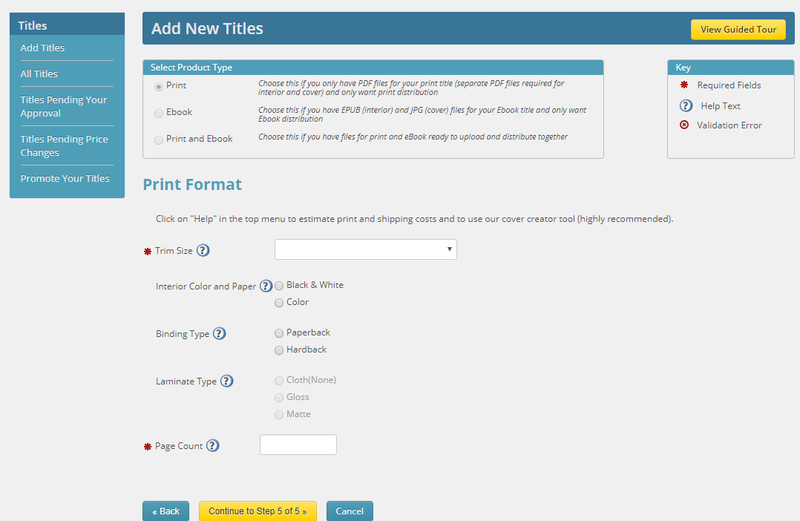 Here is how I adopted and moved each of my old JPEG book covers into the IngramSpark cover template. 1) I exported theIngramSparks template image out of the PDF file and saved it as a JPEG file. 2) Next, I resized my old cover image to match the IngramSpark Book Cover Border size in their Template. 3) I copied from the IngramSparks JPEG template the Bar Code and repositioned it in my new book cover JPEG file. 4) I copied and positioned my new book cover JPEG image into the IngramSparks JPEG I created. 5) I opened a new pdf file in my old version of Adobe Acrobat 7, and I dragged my new JPEG book cover template into it and saved it as my New IngramSparks Template and submitted it to IngramSparks. Thank you for this, Joe. My process is very similar, except that I leave the IngramSpark cover template as a PDF throughout the process and assemble it all in PhotoShop, then export to Adobe Pro to make sure everything is embedded correctly. What is the advantage of using IngramSpark over KDP? I find KDP very easy to use. The above sounds complicated, plus there is the price. Hi Helen – there were a couple of reasons I decided to use IngramSpark in conjunction with CreateSpace. When I initially started using IngramSpark, I had a strong feeling CreateSpace was going to close and we’d be forced to use KDP. At that time, KDP had no Expanded Distribution and I want my books available everywhere, not just on Amazon. At that time, I decided to leave them on CreateSpace but without checking Expanded Distribution, and then use IngramSpark to make them available wide. The second reason is that if you have a goal of getting on store shelves, your chances are better through IngramSpark than they are through either CreateSpace or KDP. This is because IngramSpark offers two things to brick-and-mortar stores the others don’t: the ability to offer a discount to stores, and the ability for stores to return books that don’t sell. Of course, having books listed in the Ingram catalog doesn’t guarantee stores will order them. We still have to market. However, not a month has gone by since I began using IngramSpark that I haven’t sold a few through there, so some stores, somewhere, are ordering them. Just a note: When you use CreateSpace/KDP Print in conjunction with IngramSpark, Amazon defaults to their own company (of course), so when someone purchases from Amazon, they get a book from CreateSpace/KDP. If for some reason that service is interrupted, as it was during the CreateSpace-to-KDP Print migration, Amazon customers will receive the IngramSpark book. Our books remained available everywhere, even on Amazon, when things went a little screwy between CreateSpace and KDP Print. Of course, everyone has to decide what makes the most sense for his/her goals, and it won’t be the same for everyone. Thank you Melinda. I truly appreciate the time you took to respond so fully. I will now have to consider using IngramSpark. You’re very welcome. Best of luck with whatever you decide. This is very helpful Melinda–thank you! All my paperbacks are now on CreateSpace, with CreateSpace ISBNs. So those ISBNs cannot work with IngramSpark, right? But a CreateSpace notation says that they own my books with those ISBNs, as it were, and that I could not purchase new ISBNs for the same books. I have also heard that IngramSpark quality print output is more dodgy than CreateSpace, especially for fiction. Is this true? The quality on CreateSpace has been excellent these last few years. Currently with CreateSpace any changes we make to the text are free, but even slight changes/revs in IngramSpark (even price alterations) are charged for, yes? My artist for all my covers is not available to add a bar code for all 19 books anymore. All the PDF files were created by her for the covers and of course CreateSpace added in the bar code. What can I do about this? I am definitely not keen on going the KDP route. And I will miss the courteous Costa Rica group. Lastly, someone I know created a Kindle ebook and now wants a paperback. I was going to advise her on setting up a CreateSpace version, but I reckon she is better off going the IngramSpark route. I will give her your instructions here, but if she has questions, I can refer her to you–do you give people help in that (for a fee, of course)? Hi Regina – let me see if I can answer everything. 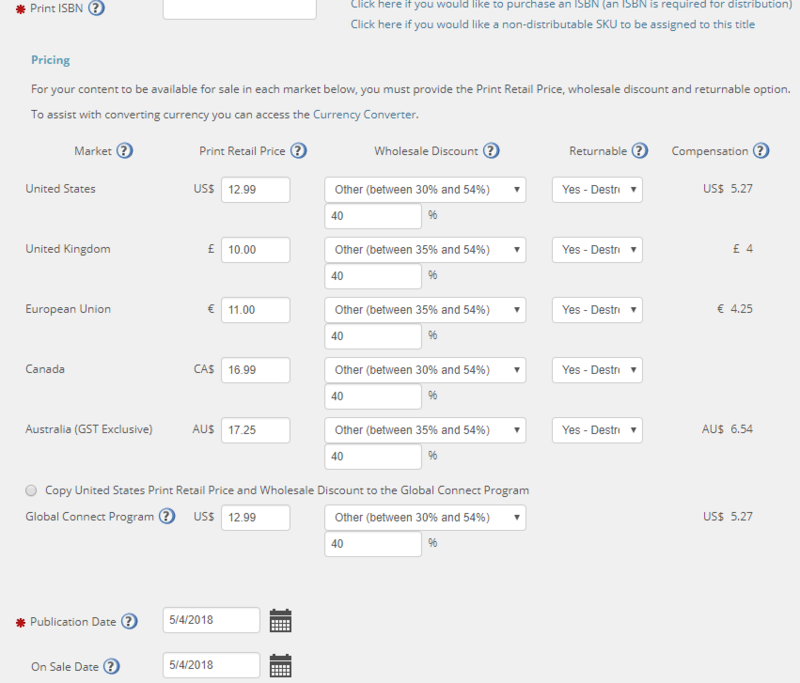 Regarding the CreateSpace ISBNs, you can’t use those on IngramSpark because they’re owned by CreateSpace, so you would need to purchase your own. If you’re in the U.S., the ISBN agency is Bowker. Regarding your books, CreateSpace does not own your books – you do. I’ve actually been involved in a very long discussion on this topic on a popular discussion board this past week. All CreateSpace owns is the ISBN they purchased and provided to you. That’s the only thing you can’t take elsewhere. You can absolutely publish those same books elsewhere with a different ISBN. Regarding print quality, there’s virtually no difference in my books printed via CreateSpace and the ones printed through IngramSpark. The only way I can tell them apart is by the last page, which has a barcode on it. Ones printed by CreateSpace also list the location and date the books were printed (for example, the one I’m looking at now says Columbia, SC 27 June 2018), but IngramSpark books don’t. That’s the only difference I can find. 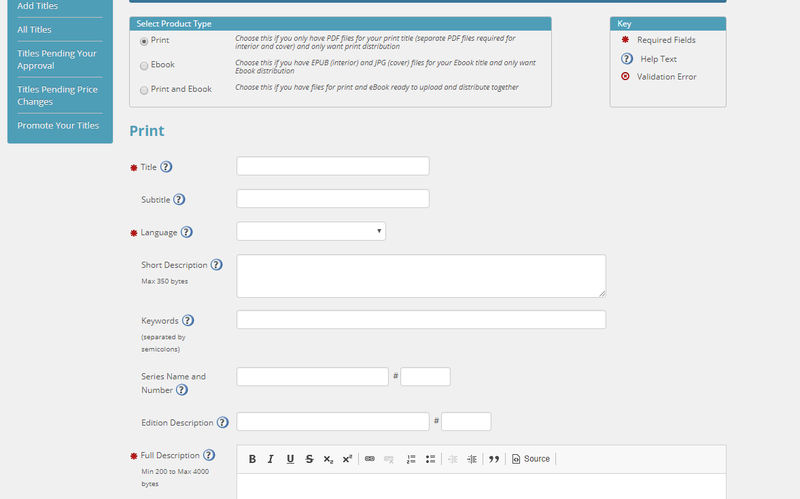 Any time you revise the files for IngramSpark, you have to pay a fee. That doesn’t include price changes, return status, discount set, etc. That’s just if you upload new files for your cover and/or interior. If you download the IngramSpark cover template, it comes with a barcode. You would still need someone to put it on your cover. There are also free barcode generators online, but I’ve never used one and don’t know much about them. Either way, the author is still responsible for getting it onto the cover file before uploading. Regarding answering questions, I generally answer them for free. 🙂 If someone has more than a handful of questions, I don’t provide paid consulting (although I’d love to!) simply because tutoring, teaching, writing, and publishing don’t leave much time! But if that’s what they need, I can usually point them in the right direction to find answers (many of the answers are probably right here on IU!). Next Next post: Which “A Forest Ablaze” Flash Fiction Story Gets Your Vote?